Adopting a CRM platform early offers many advantages, including the fact that it increases the odds of long-term success. While the cost of CRM software used to be prohibitive for most small businesses, this is no longer true. Cloud-based solutions have made the pricing much more competitive, and as many as 87% of companies now rely on them for their CRM software. 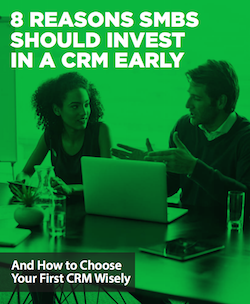 If you’re interested in learning how CRM can benefit your small business, read this guide on 8 Reasons SMBs Should Invest in CRM Early.